Picard Of The Pops - Sol Kaplan | Warped Factor - Words in the Key of Geek. Another well regarded if relatively underused composer follows Gerald Fried into the ranks of the Starship Enterprise's house band now as we look at the varied career & colourful life of one Sol Kaplan - The Enemy Within and The Doomsday Machine his contributions to the original series. A successful concert pianist, he played at New York's illustrious Carnegie Hall in 1941, with his first film score following that same year. Among his earliest such credits is an adaptation of Edgar Allen Poe's The Telltale Heart for MGM, the first of more than thirty such assignments he would undertake between 1940 & '53 alone. His career would suffer a massive disruption when he was summoned to stand before the House Un-American Activities Committee having been named as an associate by actor John Garfield, who had been accused of Communist sympathies. Senator Joseph McCarthy was behind the witch-hunt, though former Secretary of Education under President Ronald Reagan William Bennett saw his approach to the issue as a double edged sword. "The cause of anti-communism, which united millions of Americans and which gained the support of Democrats, Republicans and independents, was undermined by Sen. Joe McCarthy. McCarthy addressed a real problem: disloyal elements within the U.S. government. But his approach to this real problem was to cause untold grief to the country he claimed to love... Worst of all, McCarthy besmirched the honorable cause of anti-communism. He discredited legitimate efforts to counter Soviet subversion of American institutions." Famed CBS newcaster Edward R Murrow delivered a similarly stinging rebuke. It should be stressed that both Sol & Garfield denied the accusations levelled against them, but it was still not enough to keep Kaplan in a job with Twentieth Century Fox, who sacked him just a year into his contract. In solidarity with fellow blacklisted artistes he would score Salt Of The Earth, a 1954 feminist tract based on a miners strike which had taken place just four years earlier in New Mexico. Politics aside, he'll always have a special place in the affections of those who regard his Trek music as a high point! Certainly many feel that his work on The Enemy Within perfectly captured the good and evil of the story. So much so it was heavily re-used in other works and become a part of the show's identity. "Although he wrote only two scores for the series, New York composer Sol Kaplan's music was tracked endlessly throughout the show's first two seasons." And a glance at both Seasons One & Two reveals a surprisingly big list of uncredited appearances as stock music for his compositions. Directly following The Enemy Within, his handiwork appears in Dagger Of The Mind, Min, The Galileo Seven, Court Martial and Arena from that first series alone! Moving into Series Two, post-The Doomsday Machine, a familiar tone should become apparent during The Deadly Years, Journey To Babel, Obsession, The Immunity Syndrome, By Any Other Name, Patterns Of Force, The Ultimate Computer, The Omega Glory and Assignment Earth. Sadly it is not purely for appreciation of his music that it was repurposed so many times, stock music providing a cheaper alternative to the hiring of composers & musicians to write & play through original scores, though Kaplan's work in providing the sound-worlds for which he's best known from a science fiction perspective was indeed made up of his own original & fully orchestrated arrangements. As BMI classifies it, the reuse of Sol's music here probably qualifies as what it dubs background performance. "A performance of a work (or works) used as dramatic underscore to a scene where the music is audible but not the focus of audience attention yet nonetheless is used to set the mood of the scene. These usually are works commissioned especially for a TV program or motion picture, or are library works selected by a program producer in lieu of specially commissioned music." A similar practice was employed by Doctor Who during its early years. Just prior to October 6, 1966, when The Enemy Within was first aired, William Hartnell's First Doctor would conclude his dealings with The Smugglers, in a pure historical which used similarly sourced music on October 1. Two days after The Enemy Within's broadcast, The Tenth Planet, the début appearance of the vaguely Borg-like Cybermen as well as Hartnell's last bow as the Doctor before being replaced by Patrick Troughton, would again employ what is also sometimes known as library music. Sol's nearest equivalent in considering Trek's English cousin & its own pilfering of pre-recorded soundscapes is most likely Tristram Cary, whose music for The Daleks would later be heard & indeed reverberate throughout The Rescue, Marco Polo, The Daleks' Master Plan, The Ark, & The Gunfighters from the pre- Troughtonian period, though The Power Of The Daleks would also feature his previous work in a harbinger of change, welcoming in the scruffy new custodian of the TARDIS, who much like Picard favoured a good wind instrument. Where to boldly go now, you might wonder? 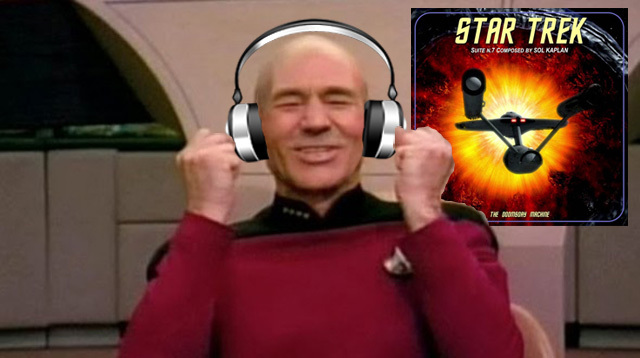 The answer lies with Fred Steiner, the man who like Dudley Simpson on Who, composed more music for Trek's original series than any of his similarly employed musical bedfellows!